ViewRanger (www.viewranger.com), the popular outdoors GPS app, is providing live-tracking and course maps for this weekend's Birketts' Round Norfolk Relay - an event that sees running clubs and athletics clubs running a course following the Norfolk county boundary non-stop over a 24-hour period through 17th/18th September 2011. Course maps for the event have been published by event organizers through the ViewRanger platform, allowing the course map to be downloaded onto competitors Apple, Android, or Symbian smartphones (see below). For an event like this that requires such team organization and coordination, being able to visualize the course in detail beforehand is a vital ingredient to any team's success. 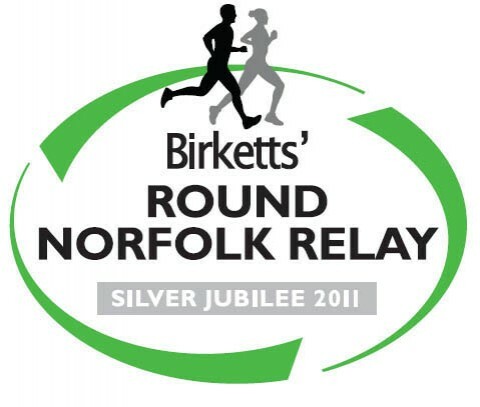 The Birketts' Round Norfolk Relay course mirrors the county boundary over a distance of 195 miles, divided into 17 unequal stages. Norfolk’s enormous skies, vast sandy beaches, open spaces and picturesque towns and villages, with their attractive cottages and medieval churches, all contribute to making the race a unique running experience. But it is likely to be the spectacular skies at sunset and sunrise which will provide the most vivid memories. The race begins with a staggered time start in Kings Lynn and then, from Hunstanton, follows the stunning coastline through 5 multi terrain stages using the Norfolk Coastal path as far as Cromer. The 35 miles (4 stages) from Cromer to Great Yarmouth are on the road. By the time the majority of teams reach Great Yarmouth it is dark. From Great Yarmouth, the course turns south-west following mains roads for 67 miles (4 stages), all run in darkness. It is during these mostly flat stages through Breckland that the time stagger unwinds and the race is invariably won or lost. On reaching Feltwell (Stage 14) there are only 33 miles remaining. These 4 remaining stages are run across the flat Fens through the early morning mist. About half way into the final stage, the course follows the Great Ouse River into historic King’s Lynn, passing by the old Custom house, through the famous Tuesday Market Place and then on to the Finish at Lynnsport. Unique in character and concept, the race presents not only a tough physical challenge, but also a test of the organizational prowess of a club. Each club must be affiliated to EA or ARC and have 17 different runners. Runners must be a member of the club they are representing. Augmentra Ltd is the Cambridge UK based Angel funded software development company behind ViewRanger, the award winning mobile app, which delivers Mapping, Navigation, GPS- enabled guides & route content and Location Sharing to anyone, worldwide, who wants to get more from their time in the Great Outdoors. The App runs on a massive range of smartphones and devices that use the Apple iOS (iPhone/iPad), Android, or Symbian OS and works virtually anywhere in the world using web based mapping, which can be cached for off-line use. Additionally, it can upgraded to run premium topographic map data like Ordnance Survey maps in Great Britain, for a growing number of countries, including Belgium, Czech Republic, Finland, France, Germany, Holland, Ireland, parts of Italy, Norway, New Zealand, Slovenia, Sweden, Switzerland & USA. A testament to the App’s accuracy and reliability is the fact that it is today used by almost 50% of Search & Rescue teams in England & Wales. The ViewRanger App is complemented by a web portal for route planning, account control and community sharing at www.my.viewranger.com. The App is also a powerful GPS-enabled content publishing platform that allows Guidebook & Route owners, like The AA, Walking World, Cumbria Tourism and Cordee to deliver their content directly to a user’s smartphone.